Details of Sony's Xperia i1 "Honami" continue to trickle on to the internet this week as a possible specs sheet and new image appeared on a Taiwanese site. The site, ePrice, published the below image with some new details about the rumored Sony flagship, which is expected to release in Korea by the end of the year. According to this report, "Honami" will indeed pack a 20-megapixel camera sensor, just as previous rumors claim. In addition to the snapper the new Xperia handset is said to sport a 2.2GHz quad-core Snapdragon 800 chip, Adreno 330 graphics, 2GB of memory, 16GB of storage, microSD, LTE and NFC support, a 5-inch full HD display, a 2-megapixel front camera, and a 3000 mAh battery. The image itself, if legitimate, reveals some interesting things about the Honami's camera. Specifically, the Sony G Lens branding is visible next to the camera and LED flash. G Lens is Sony's own camera lens glass brand. The original report also claims that the new Sony flagship will support the BIONZ image processing engine. The engine is usually comprised of a separate sensor, but in this case it's more likely to be a software-only version called BIONZ for mobile, says Xperia Blog. A dedicated camera button is also rumored. One more things about that image: it seems the Honami could come in white as well as black, the color seen in the previous alleged leak. The Xperia i1 will face some stiff competition in Nokia's Lumia 1020, with its 41-megapixel camera. 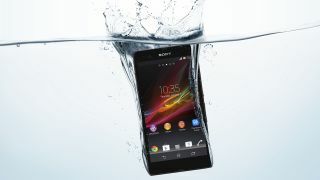 The phone is being considered a successor to Sony's Xperia Z, its current flagship, and the enlarged Xperia Z Ultra. It's also expected to be highly water-resistant. Sony may lift the veil off the device at its Sept. 4 press event during IFA 2013 in Berlin. Here's why Sony's Xperia i1 Honami could be the next camera phone king.